A short list of the top 50 articles from a poll of nearly 24,000 articles can improve your web development skill for 2019. Dirk Holtwick presents the most common Electron alternative on MacOS and iOS. Quicksort is one of the most efficient methods for sorting an array in computer science. Hailed as friendly, inclusive events, SmashingConf has broadened the horizons of what a web design conference is. Instead of showing slides, presenters prefer showing attendees how they work in a practical sense, from live debugging to live redesign. 13 speakers including Brad Frost, Sara Soueidan and Chris Coyier will be exploring practical front-end techniques and design strategies. Early Birds are now available! 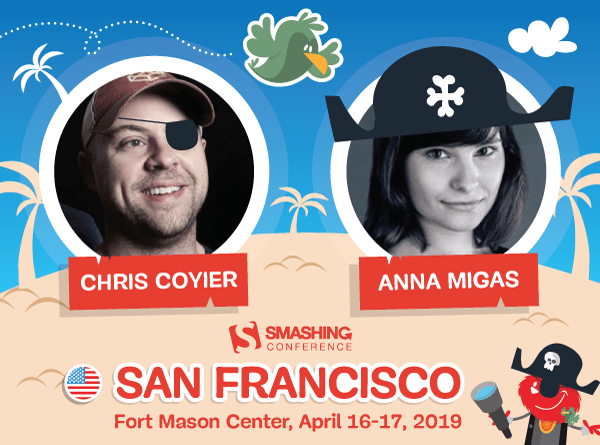 PS: SmashingConfs are friendly, inclusive events focused on real-world problems and solutions. You can also download the Convince Your Boss PDF (249 KB). The industry is growing bigger every year, making it harder for the average developer to keep up. So let’s take a step back and review what changed in the web development community in 2018.